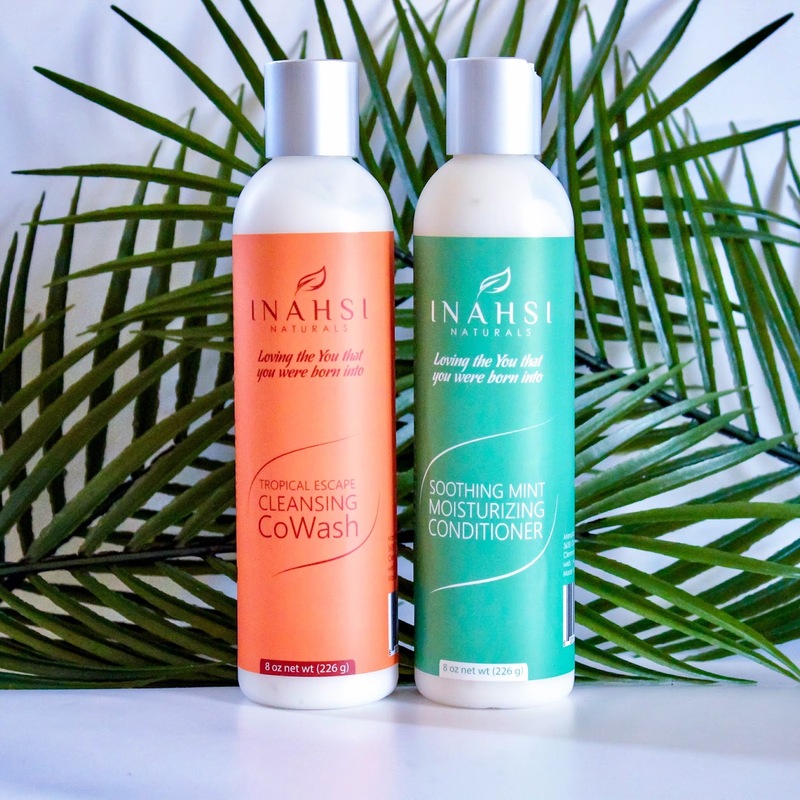 The Inahsi Naturals lineup offers the perfect wash day solutions for every hair type, texture, and preference. I'll be the first to admit it - sometimes we naturalistas can do a wee bit much.We earmark several hours for wash day - and 4 pre-poos, a shampoo, co-wash, deep condition, mud masque, and oil rinse later, our wash and go still isn't dry enough to go to bed on. 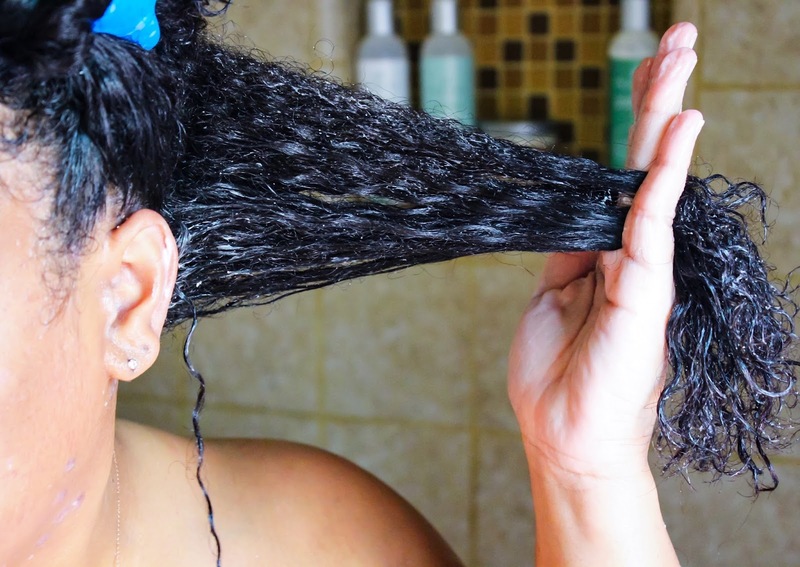 Wash day doesn't have to be that long, drawn out, or complicated. There's no need to turn into a cosmetic chemist or homeopathic doctor just to get wash day going. Perhaps I'll do a series on hacks to shorten up wash day, but for now, let's dive into the basics: cleansing and conditioning. More specifically, we're going to take some time out and discuss the three primary types of cleansing, who they're best suited for, and how often to do them. 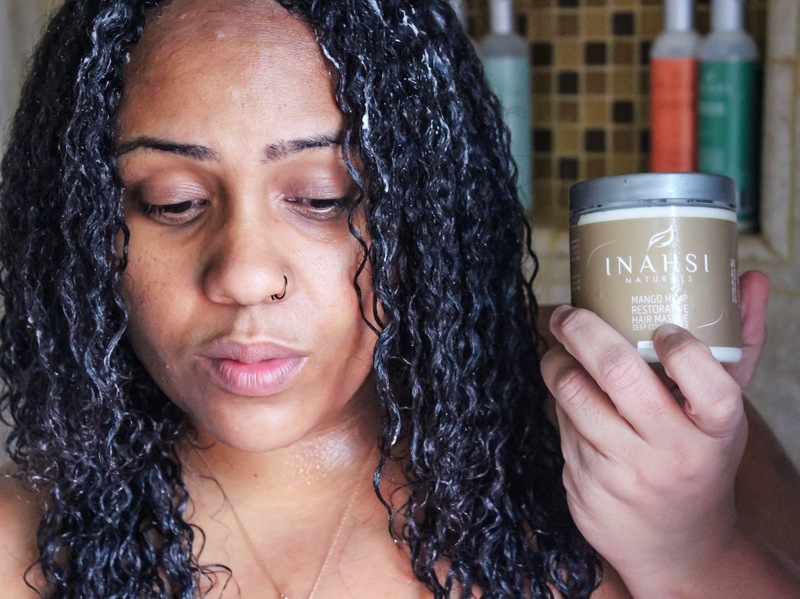 I've partnered with Inahsi Naturals to bring this content to life, because they've got a flawless (no really) cleansing and conditioning system with options of every naturalista. I don't say any of that lightly. The products and insight I'm about to share with you are legit fire. Clarifying with the Soothing Mint Sulfate Free Clarifying Shampoo. An invigorating experience for sure! Clarifying is the act of deep cleansing the scalp and hair of oil, dirt, debris,and residue with a targeted shampoo formula designed to cut through and remove buildup effectively. Clarifying, although it doesn't receive as much glory and hype, is a necessary component of any healthy hair regimen. Healthy hair grows from a healthy scalp, and a scalp cannot be healthy when covered in weeks of product buildup, massage oils, environmental debris, trapped-in sweat, and more. As far as the hair itself is concerned, did you know that regular shampoos and deep conditioners can have a cumulative buildup effect on the hair too? This is over and above your styling products, refreshers, and scalp massages. Buildup on the hair over time can cause it to begin feeling dry, rough, and even brittle or breaking. Clarifying cuts through all of it, revealing naked hair that is primed for hydration and strength. Everyone. Literally, everybody. Natural. Relaxed. Transitioning. Straight natural. 4c. 2b. Ya momma and 2nd cousin Rochelle. Say it with me: 👏ev👏er👏y👏bo👏dy👏! This is where things get a little trickier, and you have to really assess the needs of your hair, where you live, how often you wash and style your hair, and your lifestyle. I would personally recommend no more than 2 clarifying sessions per month, to prevent over-drying the hair. 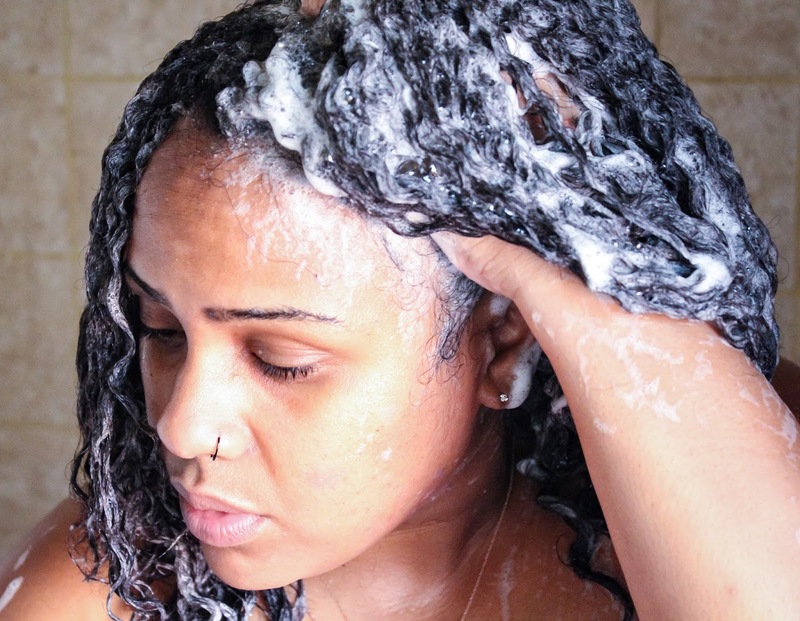 If you are the average naturalista who co-washes once every week or two, is moderately active, and doesn't slather your hair down with butter and oils every day, then clarifying monthly is sufficient. However, if you frequently use heavy butters and oils, don't co-wash between shampoos, or have an insanely active lifestyle that causes your hair to be drenched in sweat when you're done working out, bi-weekly clarifying sessions are better. This is probably the most epic clarifying and deep conditioning duo of ALL TIME. Clarifying sessions should always be followed up with a hearty deep conditioning. Because clarifying shampoos strip the buildup, gunk, and your scalp's natural oils, a restorative deep conditioner is best to follow up with. I highly recommend the Inahsi Naturals Soothing Mint Sulfate Free Clarifying Shampoo and Mango Hemp Restorative Hair Masque. The Clarifying Shampoo is quite literally one of - if not the best- clarifying shampoo I've ever used. The consistency is thin, which makes it super easy to target and apply directly to the scalp. It's minty with notes of lavender and rosemary, and has slip to boot! It leaves my hair and scalp clean and refreshed, with incredible shine. There's a slight squeaky clean feeling to it - but that's a good thing here. It means that the Clarifying Shampoo got the job done. The love I have for this deep conditioner is unreal. As I mentioned earlier, following a clarifying session up with a deep conditioner is a must. The Inahsi Naturals Mango Hemp Restorative Hair Masque delivers intense hydration, rich moisture, strength, softening, smoothing, cuticle-laying, and pH balancing goodness to the table - which is exactly what you need after your hair has been stripped. Clarified hair is actually the best hair to deep condition on - because there's nothing standing in the way of the potent ingredients and your tresses. Without getting too science-y, the general rule is that hair carries a slightly negative charge that is enhanced by use of a shampoo with a negative charge (anionic surfactant). Conditioner has a positive charge (cationic), and of course, opposites attract. The ingredients in deep conditioners are designed to stick to the hair (adsorb), smooth the cuticle, fill in chipped areas (if there is protein), and can do so better when exposed to completely clean hair and scalp. Sidebar: I'm definitely doing a separate review on this product duo, because I need y'all to understand how bomb they are. Inahsi Naturals ain't even ask for alladat. I'm doing it on GP. Creamy lather + slip = a shampoo session in paradise. The act of cleansing the scalp and hair of oil, dirt, debris,and residue with a more gentle, sulfate-free formula designed to remove product and environmental buildup without stripping the hair of natural oils. To quote Jc of The Natural Haven, "In the grand scheme of things, shampoo will remove more oil and dirt than conditioner, conditioner will remove more oil and dirt than using plain water." Translation: working shampoo into your regimen will take up a significant amount of product, dirt, and oil buildup that co-washing can leave behind on your hair. While clarifying for me is more of a non-negotiable, regular shampooing depends more on preference than performance for the most part. Some naturalistas just can't get into co-washing between shampoo sessions and liken the experience to washing clothes with fabric softener (I get it). Others still just can't give up the bubbles and suds. Regular shampooing with a sulfate-free cleanser is perfect for these naturalistas, as well as naturals who are actively dealing with scalp conditions like dandruff, psoriasis, or seborrheic dermatitis. If you're a shampoo girl, sudsing up with a sulfate free shampoo on a weekly basis or mid-month basis shouldn't have an adverse on the health of your hair, so long as you follow it up with a restorative deep conditioning session. The general rule of regular shampooing is to do it on an as-needed basis. Signs you may need to incorporate at least one monthly regular shampooing into your regimen include: flaky scalp, excessive itchiness, and hair that feels dry or hard (and seems to not feel moisturized) after a couple of co-washes. Perfect duo for the anti-cowasher. 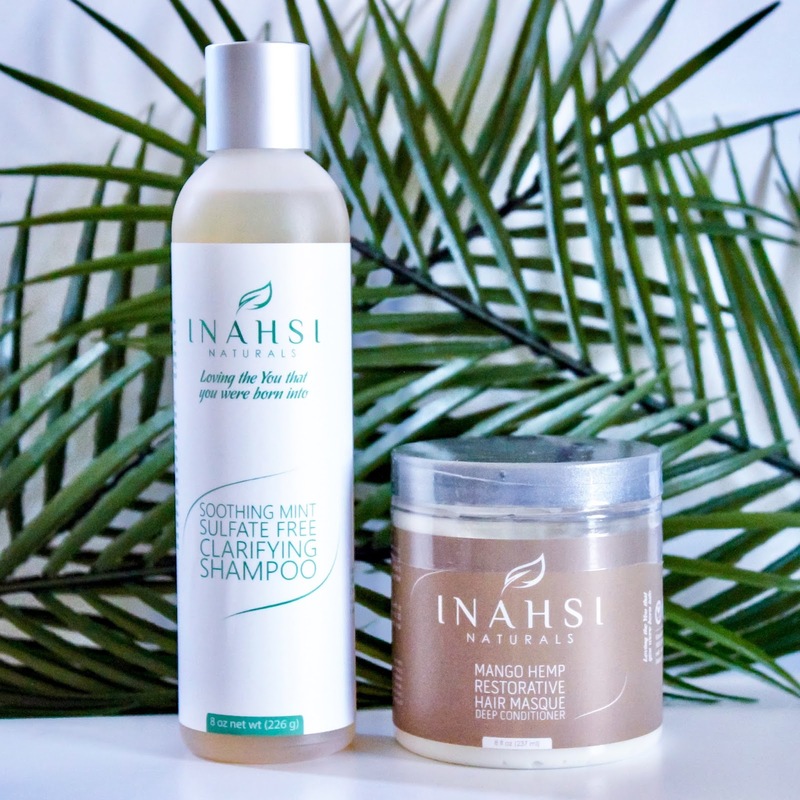 Hands down, the Inahsi Naturals Soothing Mint Sulfate Free Gentle Cleansing Shampoo and Mango Hemp Restorative Hair Masque fit the bill here. The Soothing Mint Gentle Cleansing Shampoo is a thick and super creamy shampoo with a spa-like essence, thanks to peppermint, lavender, and rosemary essential oils. It also contains coconut and avocado oils to mitigate protein loss (which makes it an ideal shampoo for weekly or bi-weekly cleansing) while improving elasticity to ward off breakage. Soothing Mint Gentle Cleansing Shampoo does not strip, has good slip, and leaves the hair and scalp feeling clean and invigorated, yet moisturized. Paired with the Mango Hemp Restorative Hair Masque, your tresses will emerge thoroughly cleansed, strong, soft, moisturized, smooth, and primed for styling. Tons of moisture, slip, shine and smoothness with the Tropical Escape Cleansing Co-Wash. And the scent? HEAVENLY. 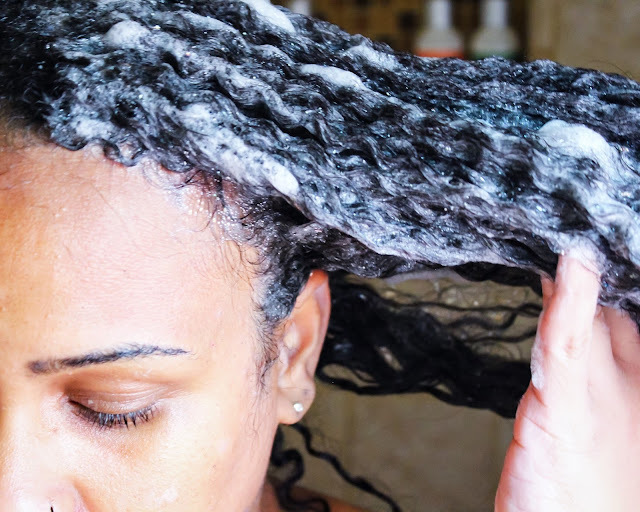 Co-washing is the act of partially cleansing or resetting the hair by using a non-sudsing cleansing conditioner or regular rinse-out conditioner. Why it's important: This is another one of those 'depends on who you ask' moments. As I mentioned previously, some naturalistas can't jive with co-washing, and that's fine. Others swear by it, and that's fine too. My stance on co-washing has evolved since my transitioning days. I'll talk more about my journey and current regimen in a bit - but for now, let's discuss why many naturalistas opt to co-wash regularly. The logic above from Jc applies here still - with co-washing being less effective than shampoo, but still effective. Many co-washes and conditioners contain cationic surfactants that will lift some (but not all) oils, dirt, debris, and product buildup. For many naturals, it gets up just enough to get the job done while leaving the hair incredibly soft, moisturized and frizz-free. That last part is quite possibly the biggest benefit - co-washing resets the hair jusssssst enough for another round of styling, while allowing the hair to be rehydrated via saturation with water and conditioner more often. Texture typing aside, medium/normal to high porosity naturals tend to benefit from co-washing because unlike our low-po sistas, water escapes more rapidly from our hair and benefits from constant replenishment via saturation with water and co-washing. The essence of the wash and go involves capturing the coil and curl pattern of wet hair with a combination of water-based leave-ins/creams and gel. The majority of naturalistas who rock wash and go's seek some level of definition, to assist in the longevity of the style. Regular co-washing helps to streamline this process, and the majority of styling agents can be broken down (for the most part) by conditioner and cleaning conditioners. Whether it be on-the-job protocol (another topic for another time), lifestyle-based, our out of sheer convenience, the low maintenance/manipulation naturalista can also benefit from co-washing regularly, simply because they don't put too many heavy products on the hair on a regular basis. The less you put on, the less there is to take up. Back in the earrrrrly days, I would see tons of naturals that co-washed daily to refresh their wash and go's. If this is still you and it works - by all means keep doing it. I've discovered that the majority of naturalistas who opt to co-wash do so every 4-7 days. This time frame allows for consistent rehydration, longevity of style with little to no manipulation, and minimized tangles. As a rule of thumb, I never go more than 8 days without co-washing. If I take longer than that, I'm heading into "might as well shampoo" territory. Perfect duo for travel, the gym, and between shampoo sessions. Most conditioners formulated for cleansing tend to be incredibly gentle and packed with tons of moisturizing properties. 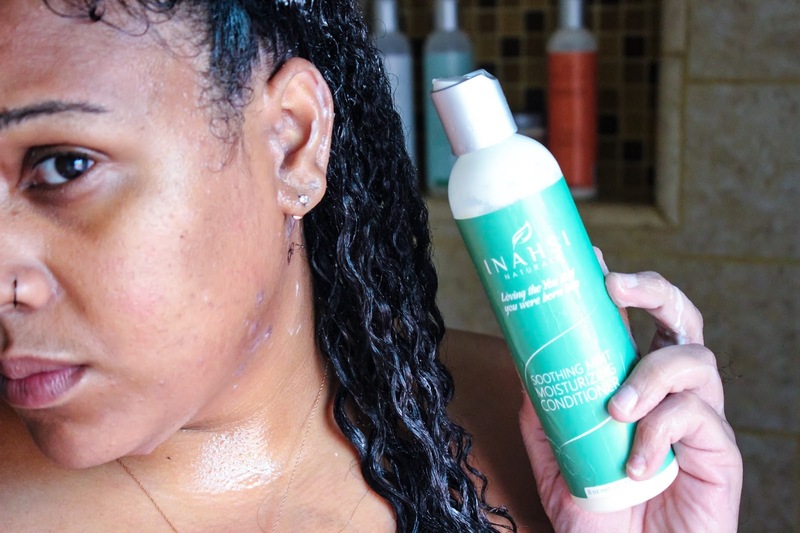 Inahsi Naturals Tropical Escape Cleansing Co-Wash is no exception. Packed with aloe, glycerin, coconut, and avocado oils, Tropical Escape Cleansing Co-Wash hydrates, softens, and detangles while gently removing product buildup and dirt, and leaving the hair frizz-free. While you can pair Tropical Escape Cleansing Co-Wash with the Mango Hemp Restorative Hair Masque, I've found the Soothing Mint Moisturizing Conditioner to make the perfect pairing. It isn't always necessary to deep condition post co-wash, because much of the hair's natural oils have not been taken up. The Soothing Mint Moisturizing Conditioner packs a moisturizing punch while delivering creamy smoothness and strength to the strands. Thanks to peppermint, hibiscus, nettle, and horsetail extracts, the scalp is stimulated and nourished to promote health and growth. My natural hair regimen has taken some time to evolve, mainly because I've been through so many phases and had to adjust to account for the needs of my hair. Transitioning needs are different from newly natural needs, are different from seasoned natural needs, are different from color treated natural needs, are different from color damaged natural needs - and so on, and so on, and so on. In the beginning, I was strictly shampoo. Then I discovered Aussie Moist, and went co-wash crazy. It seemed that by the end of every month, my hair hated Aussie moist - feeling crunchy, dry, and unmoisturizable...while still in the shower. After reading up on co-washing, I realized that my hair needed both. So I began incorporating both into my regimen. Then, after coloring my hair I went co-wash crazy again. It helped my hair, but my scalp began to suffer (I have scalp psoriasis). So a whoooole lotta time, growth, and tinkering later - I've arrived at a regimen that works for my hair. Yes, I wash my hair twice a week. 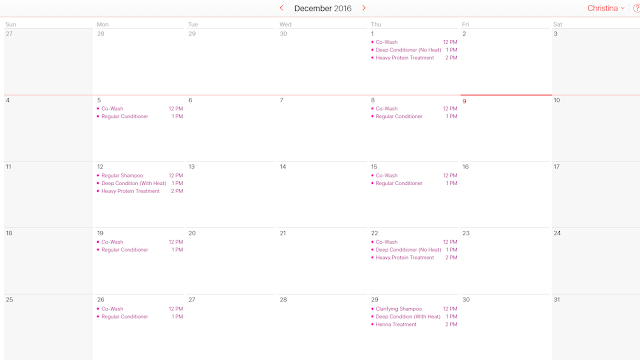 I try to keep it to Mondays and Thursdays, but I always prioritize the needs of my hair over being super rigid and regimented. And sometimes, life gets in the way and I may skip one co-wash, or swap it for shampoo if my scalp starts feeling janky. The biggest change I've made to my regimen is transitioning from deep conditioning and using heavy protein with every single wash. Back when my hair had way more color damage, it was necessary. But now that I'm in a much, much, much, much, MUCH healthier place with my hair, it's a waste of good product and money. Regular/rinse out conditioners are my new BFFs. Just keep in mind - this is my regimen, tailored specifically to the needs of my hair. Feel free to use this as an example and customize it for your hair's own needs. 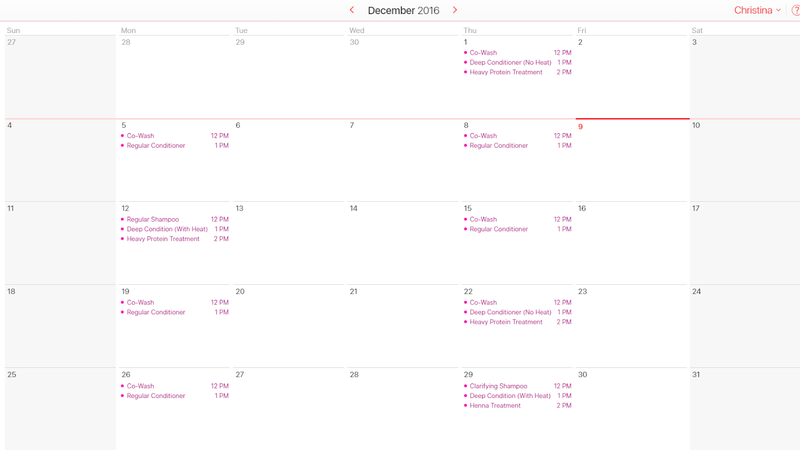 And no, I don't keep a hair calendar - I'm not that obsessive. I literally typed this up as a visual representation for you guys :) I'm going to go into a little more detail with my e-mail fam this weekend - so make sure you're on the list (sign up at the bottom of this blog post) if you want the inside scoop! And don't forget to head to www.inahsi.com to pick up your wash day essentials. Every natural hair texture and type can benefit from Inahsi Naturals' amazing range of cleansers and conditioners. 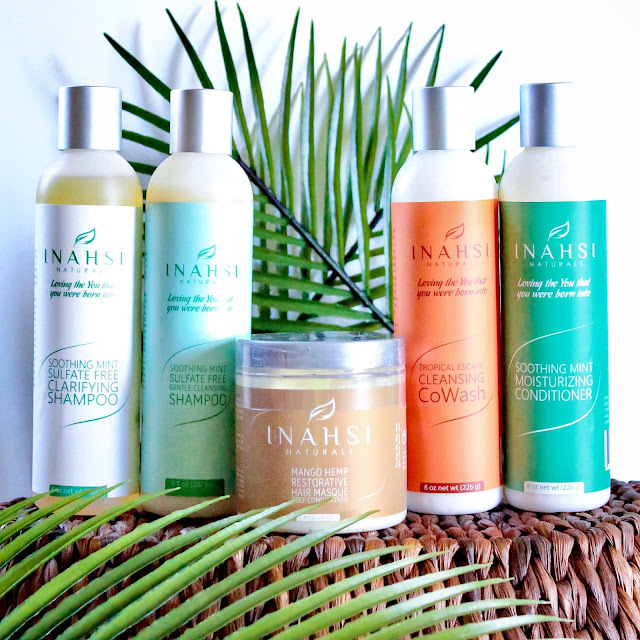 All Inahsi Naturals products are sulfate, silicone, paraben, petroleum, mineral oil, GMO, glycol, and cruelty free. Plus, they're Black-owned and handcrafted. A win all the way around in my book! What's your cleansing and conditioning regimen like? 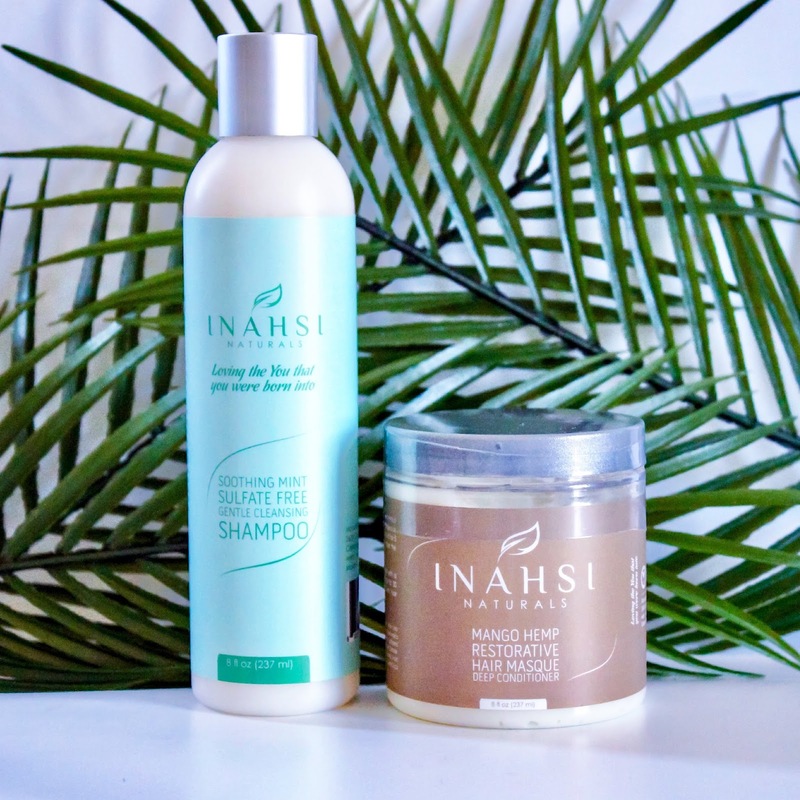 Let me know in the comments below - and if you're going to try Inahsi Naturals, let me know too! And don't forget to sign up for my e-mail list below! First of all thanks a lot for taking time to put together all this information and educate us about hair with a touch of humor which I absolutely enjoy. You are one of the first bloggers I followed when started my journey 2 years ago and to this day I keep learning a lot from your posts so thanks again. I'm still on the search for a clarifying shampoo that does not make my hair feel like I put dishwasher on it. No matter if I spend an hour prepooing to detangle and remove the shed hair before washing my hair would still get roughand tangle even worst during cleanse. I'm a high porosity so co washing is my thing but I know is important to clarify due to build up so I keep trying. Maybe I have not tried the right product. Anyway I have a question, why do you include a deep conditioner before protein? I thought a simple rinse out conditioner after the protein treatment would be enough for moisture balance.